Are you guys watching Chef’s Table on Netflix yet? So much crazy passion and inspiration in under 50 minutes and there are only 6 episodes – you can totally commit. I remember back in design school my teacher always emphasized the importance of not falling for the cozy-little-house-with-a-picket-fence dream. We need to go out, be passionate about something we believe in and change the world. I kinda feel like I let him down. I took the very first job that was offered to me – knowing well it wouldn’t come close to satisfying me creatively but out of this creative desperation earthy feast was born. It may seem a little far fetched but I like to think that in some ways I’m making a difference with this blog. Maybe I’m inspiring people to try a new vegetable for the first time or getting them excited about making a delicious home-cooked meal. Lots of tiny changes lead to big change over time. I believe that. 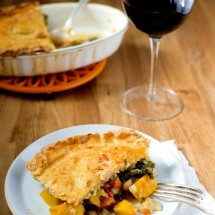 When the lovely Renee from Will Frolic for Food asked if I wanted to make a dish for an edible flower potluck party(!) I was totally overwhelmed. I have zero experience with edible flowers and have only come across them a handful of times in my life. But no way was I going to allow my insecurities to get in the way of this gorgeous celebration. Flower power people! 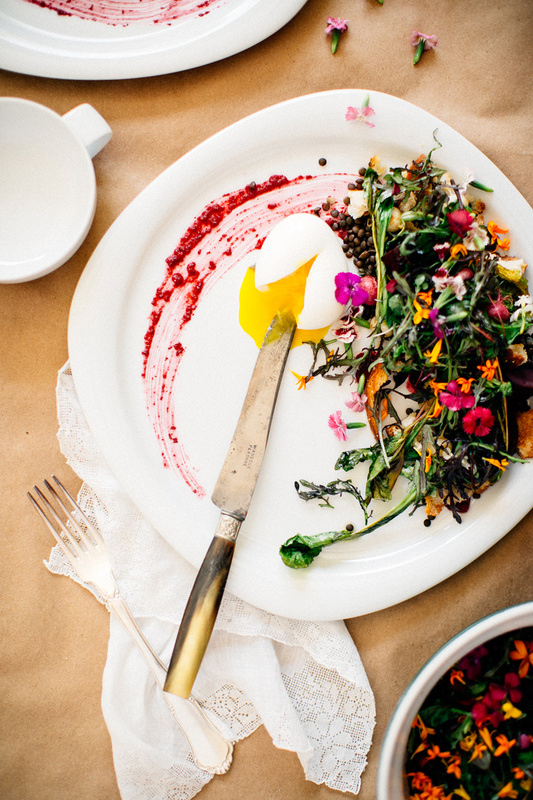 It’s kinda crazy how a few colorful petals can transform a humble lentil salad. 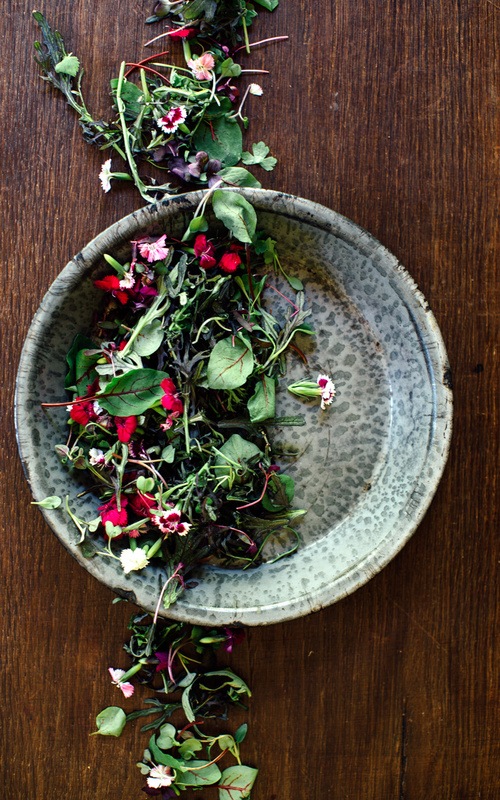 If you can’t find flowers, microgreens are just as beautiful in my opinion – and you can easily grow your own! 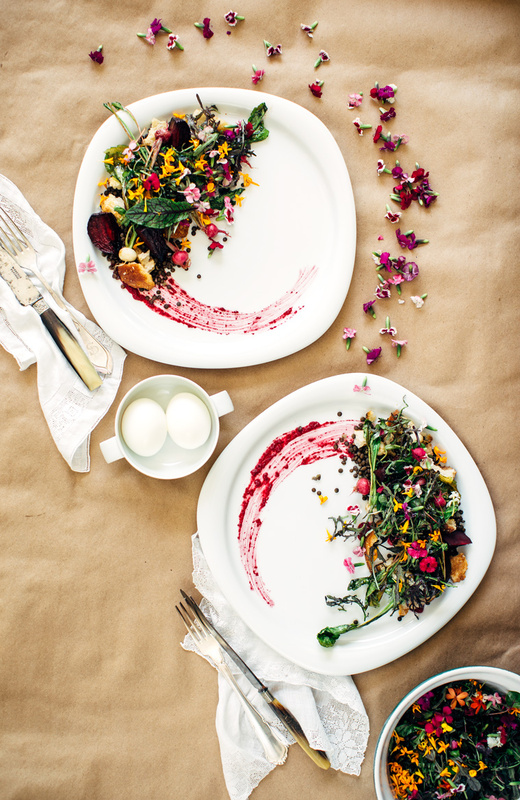 The microgreens and petals are lightly dressed with a little lemon juice, olive oil and honey – super simple so not to distract from their delicate flavors. 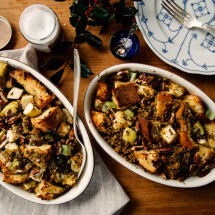 The beet dressing for the lentils is more savory and mellow – roasted garlic adds nutty, caramelized notes, a nice contrast to the light, bright greens. 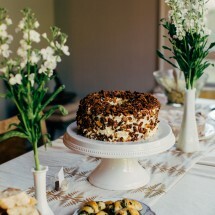 I’m completely blown away by the bounty of beautiful dishes this talented group of bloggers have brought to the party – check them out below! For more flowery inspiration checkout #frolicforflowers on social media! Cook the lentils per directions. While the lentils cook, quarter the 3 small beets, toss them with a bit of olive oil, s&p and roast at 400F for 15 minutes until tender. 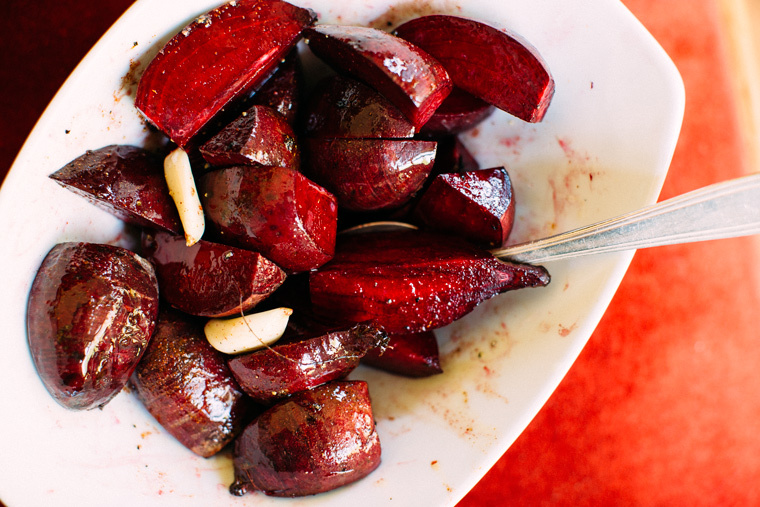 Reserve one beet for the dressing after roasting – combine all ingredients in your food processor or blender, taste for salt and pepper. 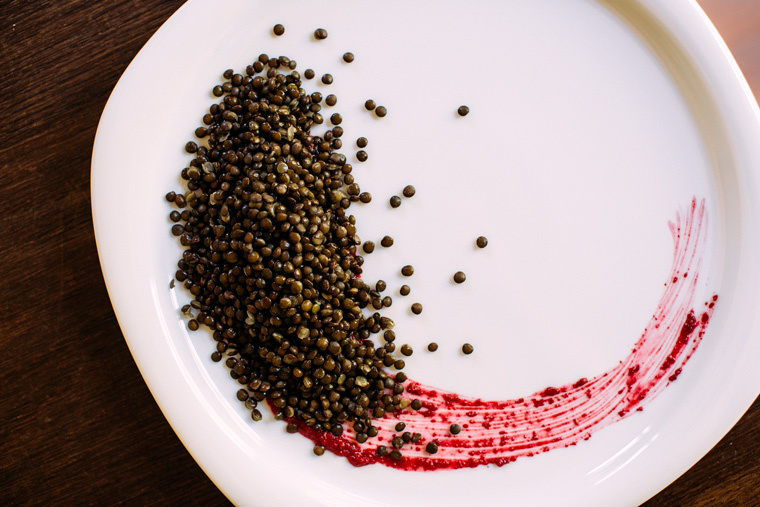 Toss beet dressing with the cooked and drained lentils or assemble as shown. 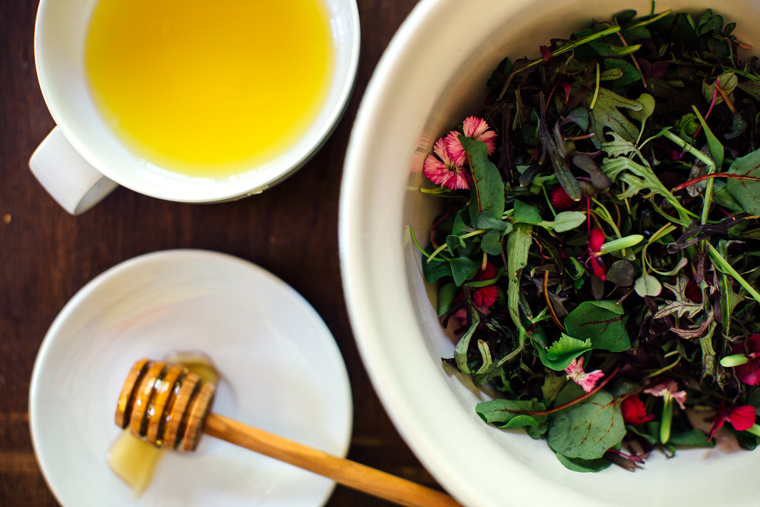 Toss citrus dressing with the baby greens. See the rest of the instructions below. Cook the lentils per directions. While the lentils cook, quarter the 3 small beets, toss them with a bit of olive oil, s&p and roast at 400F for 15 minutes until tender. Reserve one quarter piece for the dressing after roasting. 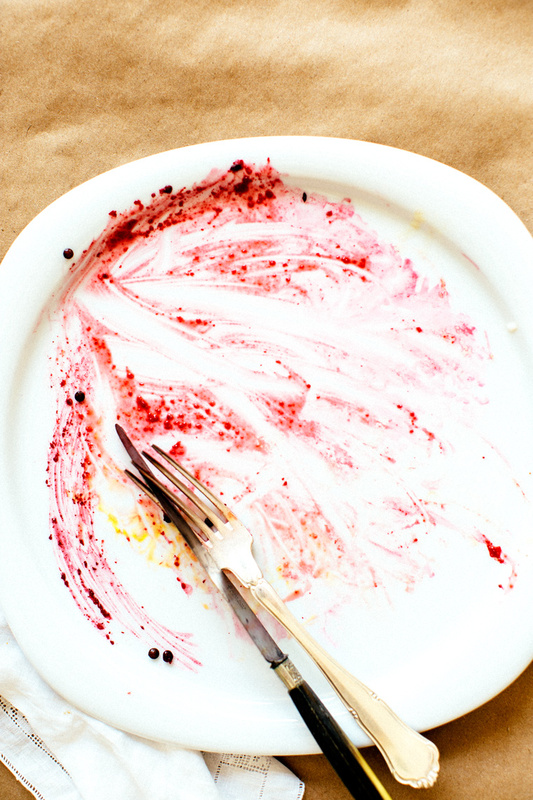 Place sourdough bread pieces on a baking sheet – roast along with the beets, checking for toasty crispiness after 5 to 8 minutes. Boil the eggs to your liking – I just cooked them for 4 minutes here. Make the beat dressing – combine all ingredients in your food processor or blender, taste for salt and pepper. Make the citrus dressing – combine all the ingredients into a small bowl and whisk with a fork. Heat up 2 tablespoons of butter in a pan, let this get nice and light brown and fragrant. 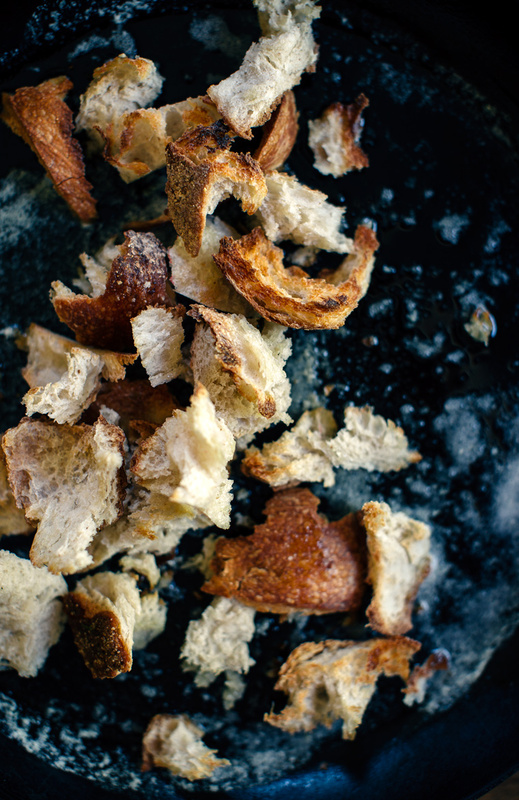 Toss the sourdough bits into the butter to coat. Set them aside. Heat another 2 tablespoons of butter and let this also get nice and foamy and fragrant. 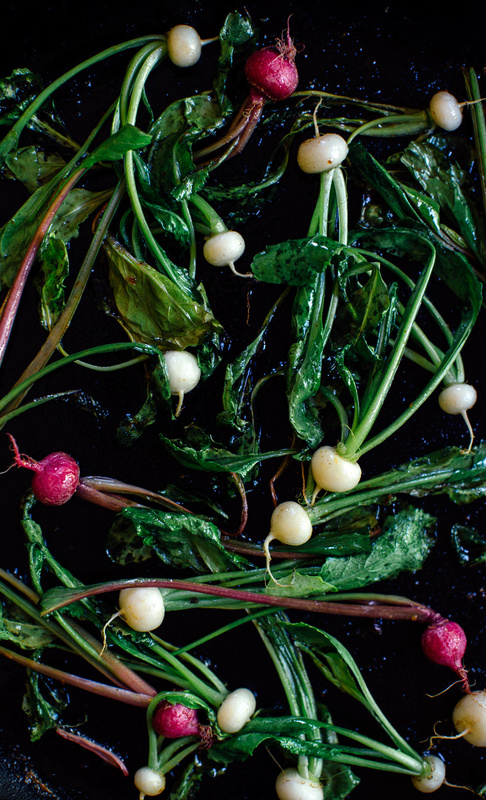 Sauté the baby turnips – cut the bigger ones in half beforehand but you can keep the tiny ones whole. Cook for about 5 minutes or until lightly browned. Toss beet dressing with the cooked and drained lentils. Toss citrus dressing with the baby greens. Assemble as shown. 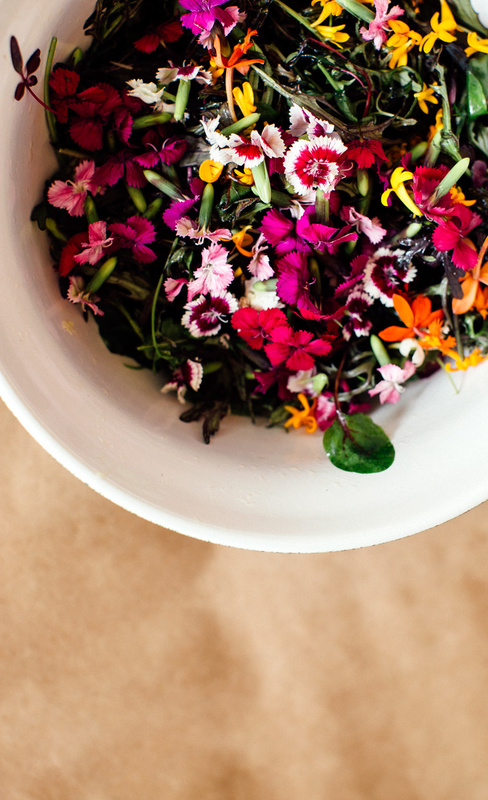 For more edible flower tips and tricks check out Shelly’s post! 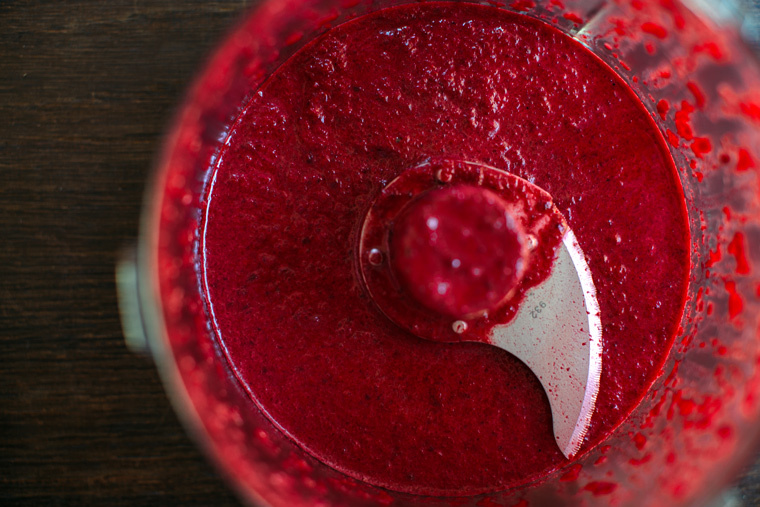 I’ve made a previous version of this beet dressing before – check it out here. I love the sound of this! 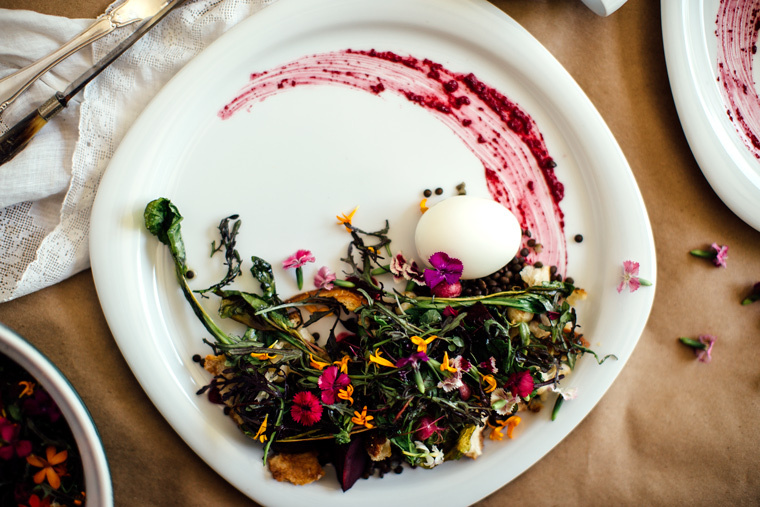 What a creative use of flowers and this salad is just so full of goodness of all different sorts. Perfect! This salad is absolutely gorgeous! And I can totally relate to having a blog as a creative outlet, it’s so much fun! Gorgeous, gorgeous lentil salad, on all levels. Your pictures, wow! This! So beyond gorgeous, can’t wait to dig into that beet dressing. Happy May! From here it looks like you’re a pro with edible flowers! I love lentil salads and this is the prettiest one I’ve ever seen. And browned butter?? I CAN’T WAIT to try this one! oh god. those soft boiled eggs. DROOL. i think it’s safe to say that this post is as beautiful as it is delicious. or as delicious as it is beautiful. needless to say, EXTREMELY on both counts. my eyes are popping out of my head and i’m doing cartoon double takes over this. YOWZA!!!! I know I’ve told you this like 10 times by now but WOW – this post is so so so so so beautiful and inspirational! 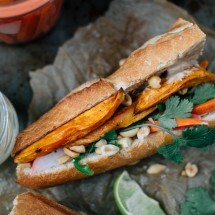 I love all the close up texture photos of the ingredients and the plating…it’s all just too perfect! So in love with everything about this! 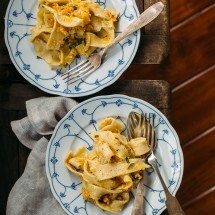 Your food photography is where art meets food. Absolutely gorgeous! So glad we discovered your blog through frolic for flowers. 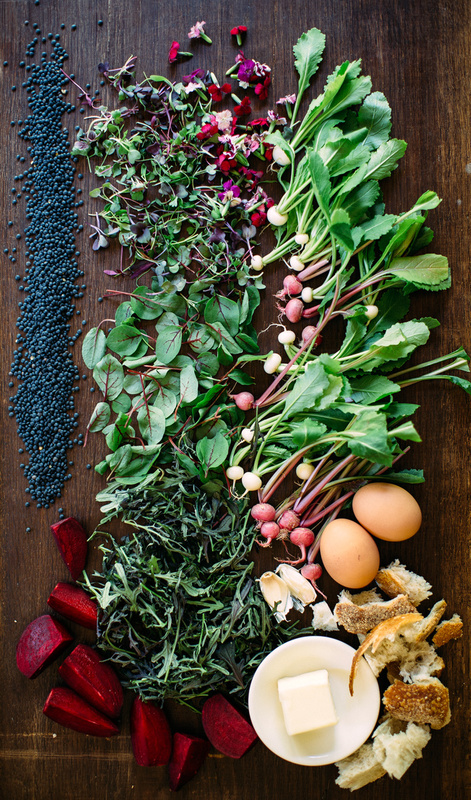 This may just be the prettiest salad I’ve ever seen. A few years ago my cousin made me a salad with flowers, and I’ve wanted to recreate it but never have. Now this really makes me want to get my flower salad on! I keep hearing from multiple sources that Chef’s Table is awesome. Must get on that as well. I LOVE this salad so much. Lentils are one of my favorite things to pack for lunch in salad form. 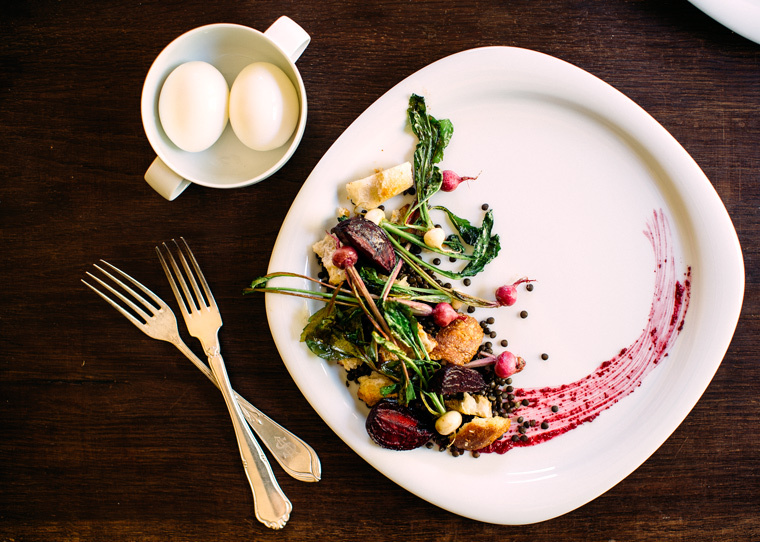 That combined with the greens, flowers and that yolky egg is just a work of art. 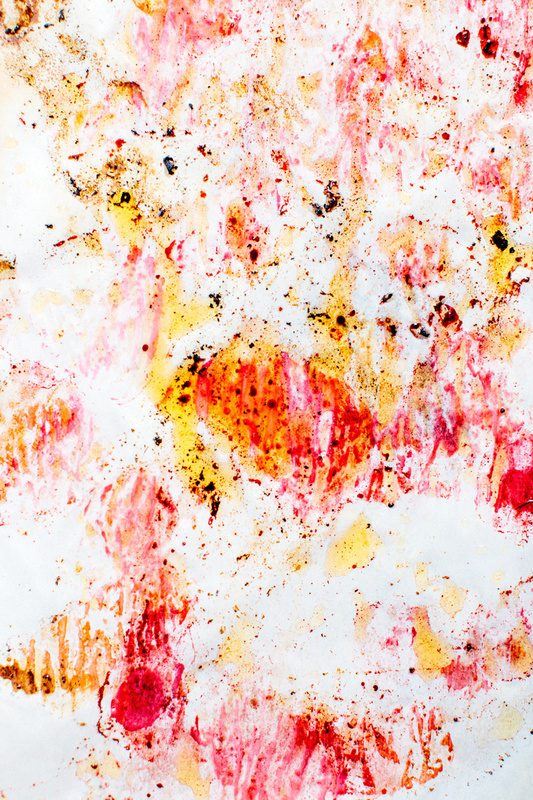 Even the parchment paper and plate with just the stains from the vegetables are beautiful. Blown away! 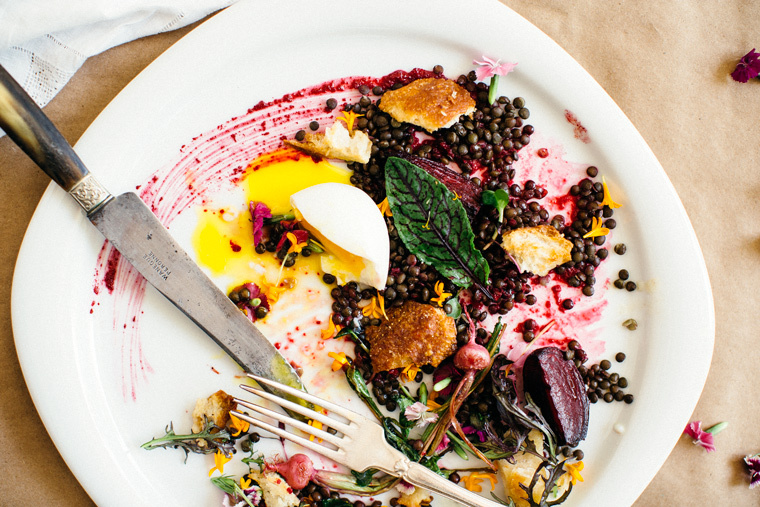 Pretty sure this is the loveliest lentil salad in all the lands. GORGEOUS. And the plating is 100% perfect. Gonna have to add Chef’s Table to the queue asap! These pics are beyond gorgeous! 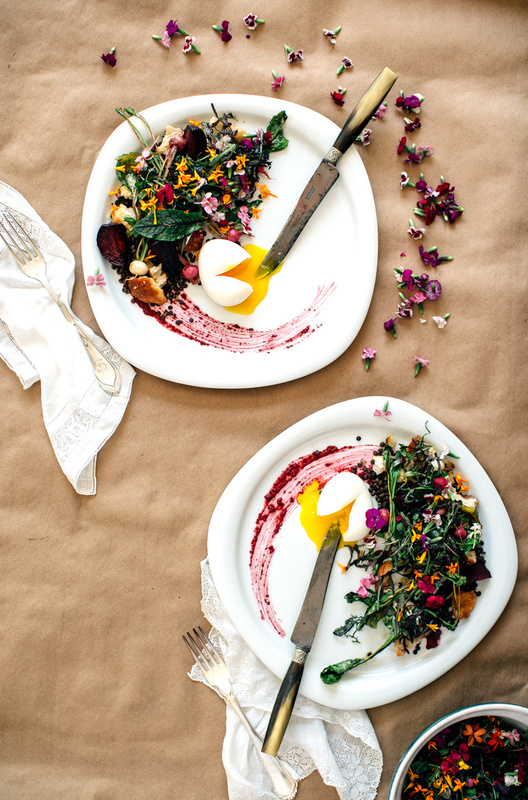 Those flowers and that runny egg yolk – what a perfect match. I truly enchanted. Um. Before I go on, can I just say, how the HECK did I know not your blog before Renee’s potluck? Your photos are fricking GORGEOUS. Your presentation is STUNNING. And NO I WON’T STOP WITH THE CAPS. This is BEAUTIFUL. I can’t stop oggling your photos. Gorgeous, gorgeous, gorgeous post!! This salad is so beautiful!! I know I say this every single time I comment here, but your pictures are so beautiful and inspiring!! Love, love, love this salad! Grace, you inspire me beyond belief and all I’ve read from your so far is this one post. Though I have been stalking you on instagram a lot sooooo whoops. I think I already told you how much I love those soft boiled eggs, right? I REALLLY DO. They are so adorable. 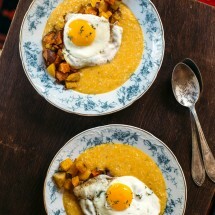 I went through the step-by-step of this recipe and I’m amazed at the simplicity of it all. Easily something I’d add to my dinner list! You knocked it out of the park with this one. Keep doing this blogging thing. Life doesn’t always take you in the direction you expect but somehow as long as you do things with heart, it will work out. This is beautiful Grace – what gorgeous photography! !